At the well-seasoned age of 42, I decided to quit what I was doing and pursue the career that had always meant the most to me. I went back to university, completed an MSc in Knowledge Discovery and Data Mining, and applied to join the Civil Service. I wanted to put my talents to work in a way that would benefit people (and not necessarily shareholders). Besides, the huge scope of data and information available within government was an immediate attraction. Without a doubt, DWP has the most extensive range of data sources of any government department. Also, I felt that data science was in its infancy here, so there was a unique opportunity to be part of something new and exciting and to influence the direction of travel. Since starting in my new role I’ve given a number of presentations on hot data science topics to analysts. My particular passion is for text analysis and ensembles. It amazes me how often people can be quite apprehensive of new techniques – until you explain to them exactly what something does and how it works. I’ve also worked on a training program to teach R to analysts more used to working with SAS. Not only does this new language offer a huge variety of new and interesting techniques for analysts – it’s also free! In the next year I’m looking forward to providing support and guidance to a new generation of data scientists. I’ll be building our capacity by improving our data pipelines so that we can do more really interesting stuff. I’m also looking forward to exploring new hardware environments, for example AWS, Amazon’s cloud computing service and Azure, the Microsoft equivalent. 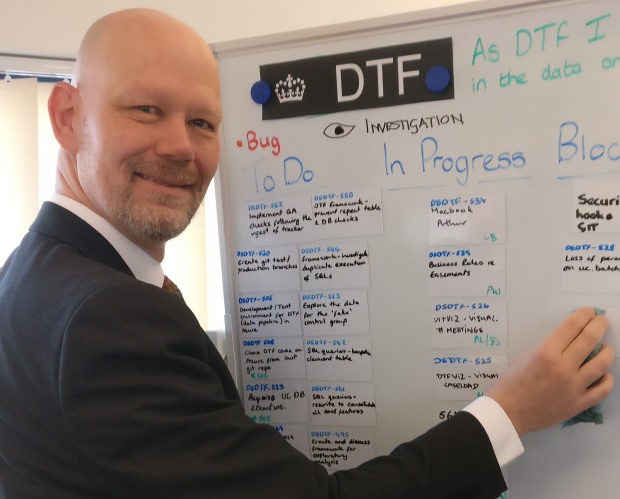 I’m also looking forward to this being the year when our team will really strike out and produce some ground-breaking tools and widgets for DWP. We’re recruiting, why not take a look at our current vacancies? You can also find out more about what's happening in DWP Digital by subscribing to this blog, checking out our LinkedIn page and by following us on Twitter @DWPDigital and @DWPDigitalJobs.